Join the Bedfordshire Woodwind Academy Flute Ensemble for an exciting and inspirational day directed by Ian Clarke – one of the world’s leading flautist/composers with internationally renowned multi-award-winning flautist Gareth McLearnon on Bass and Contra Bass and world-class perfomer, accompanist and piano teacher, Tim Carey. 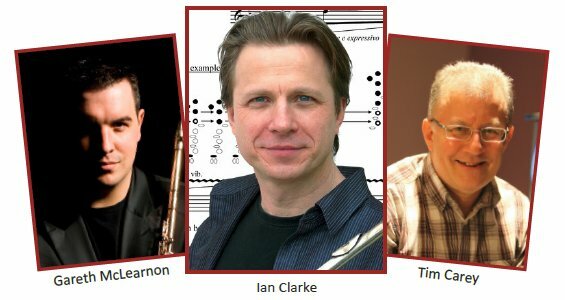 The day will focus on ensemble playing with sessions including alto and bass technique and a chance to book a slot to work on repertoire with a pianist. There will be workshops on topics such as creativity and technique, lots of group playing, and at the end the day there will be a fun concert involving everyone, including performances from our esteemed guests. We look forward to meeting flautists of all ages and abilities, if you're not sure if it is for you please contact Liz via email, or call her directly on 07711 080275 or 01582 883420 and take a minute to Google Ian, Gareth and Tim to find out what a very exciting day this will be. Price is just £45 per person, refreshments will be provided but please bring your own lunch!